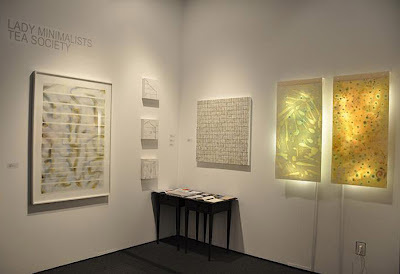 The Lady Minimalists Tea Society booth at ART Santa Fe 2012 got lots of attention and interest. This was our debut exhibition, and we were delighted to be showing in our hometown of Santa Fe. Our booth was beautiful, elegant, and very well received. Two articles were published about our work -- one, from the Albuquerque Journal North and the other in the Santa Fe New Mexican's Pasatiempo. Installation view of our booth at ART Santa Fe 2012. From left: Dara Mark, Janice Wall, Diane McGregor, and Paula Roland. 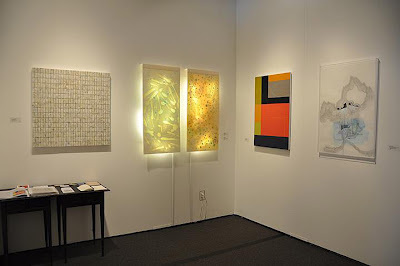 Installation view of our booth at ART Santa Fe 2012. From left: Diane McGregor, Paula Roland, Danielle Shelley, and Shaun Gilmore.